I spotted it on my usual weekend trip to Housing works. In the household section, at the back of a shelf, was a mustardy yellow and very retro Pyrex casserole. The lid rattled slightly and it had a nice heavy feel to it. I promptly paid the $12 (yes, Manhattan prices....) and brought it home. Pyrex was made in the 50s and makes for the perfect kitchen accessory for any vintage lover. The stuff was built to last and the designs are wonderfully retro. As a result, it has now become quite collectable. It makes the perfect item to thrift, so keep your eyes open for it. If you thrift some Pyrex, check out the Pyrex love website to figure out what you've got. I believe my casserole is part of the Butterfly gold collection, who knew? Throughout the winter I trudged through the snow, braved the wild winds and got drenched in the rain as I braved the elements to thrift in the city. Now, as New York City welcomes its first days of spring I've decided to emerge from my prolonged blog hibernation. Let me tell you about a thrift store I discovered this past winter: The Cure Thrift shop. My friend Flora, my fellow thrift addict, told me about it and promised great things. Well the girl was right - this place rocks. A book area. Flora perusing the selection. This thrift store is gigantic (remember there is no space in Manhattan!) and I was very impressed. 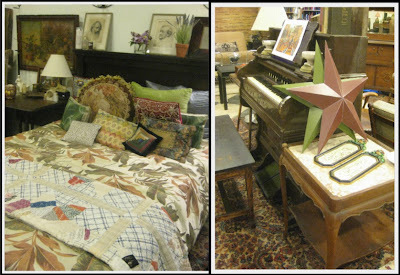 I fell in love with a couple of furniture pieces, and although I spotted some good deals, the majority had a hefty tag - cheaper than an antique shop but not exactly thrifty. You pay for the good selection and nice layout. The basement is filled with clothes, shoes and handbags - and has a men's section. Luckily they have a big spring sale going on - they advertise their sales on their website and on craigslist - and for the last two sale days they will be holding a $15 per stuffed bag. Watch this space! 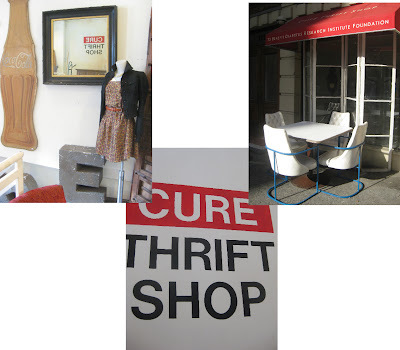 The Cure thrift store is on East 12th and 4th avenue and is open late on week days (8:30) and on the weekends (8pm).